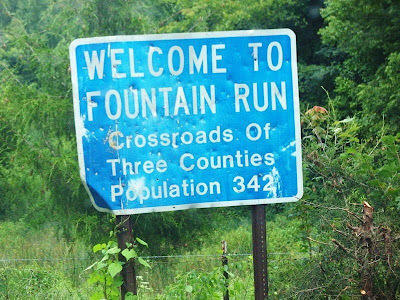 Fountain Run is a small - very small - town (the sign says population 342, but the last census said 236) which sits exactly at the three-way intersection of Allen, Monroe, and Barren Counties. Of the three, Monroe is the county that officially claims it. Using the sign for target practice seems to be a major local pasttime.